Peru Hop Private Terminal just 10/15 minutes from hotels/hostels. Click HERE to view map (address will be on booking confirmation). IMPORTANT: 2019 tickets selling faster than ever... Book now to avoid disappointment! Nazca Lines Viewing Tower – Climb the tower and see 3 of the Nazca Lines for free. Pisco Vineyard Tour – Discover how Pisco is made from grape to bottle and taste free samples of Peru’s national liqour. 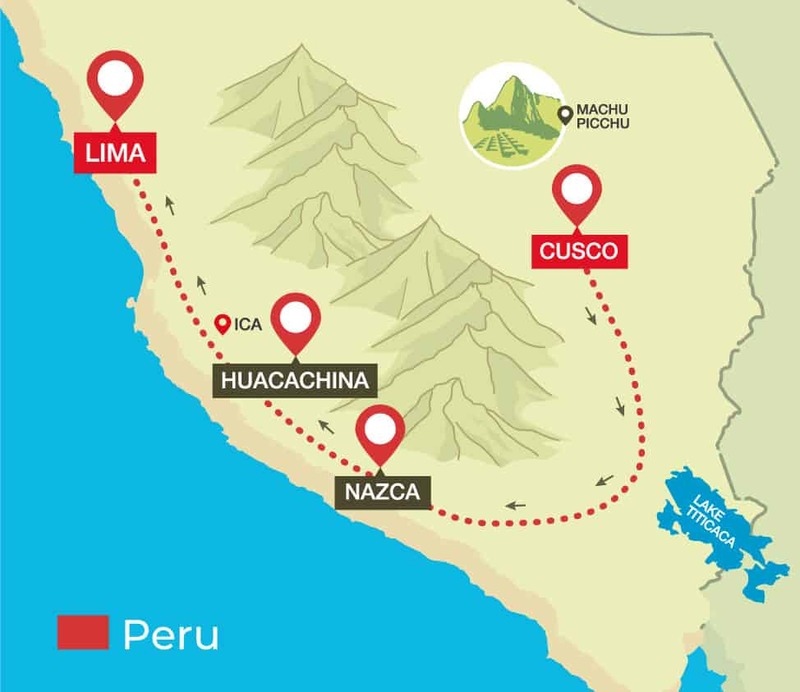 After Cusco, the beautiful and cultural city known as the gateway to Machu Picchu, it’s time to move further up Peru towards the incredibly hot and picturesque Huacachina. But first, enjoy seeing the famous Nazca lines for yourself from the viewing tower free with your Peru Hop pass. Nazca Flights Flight: If you want to do the Nazca Lines Flight, you can take a public bus from Huacachina to Nazca at 08:00am, take the flight, and we will pick you up at 07:00pm in Nazca. Just ask your guide if you want more info. on booking. We do not recommend spending time in Nazca as there is not much to do, but your ticket does allow you to hop off in Nazca and get on the next bus if you so wish. Dunebuggy and Sandboarding: Guaranteed to be one of the biggest adrenalin rushes you will have in your life! Dune Buggy through the dunes of the desert, sandboard down and finish it all off by taking some stunning snaps of the desert sunset at the end. The tour begins at 16:30pm and lasts 2 hours. Departures From: Peru Hop Private terminal just 10/15 minutes from hotels (address will be provided on booking confirmation). We recommend staying 1 night in Huacachina. This way you can enjoy looking at the stars from the desert oasis during the night and also experience the fun day time activity of a dune buggy and sandboarding tour! We can help you book your accommodation. Note: We do not recommend spending time in Nazca as there is not much to do, but your ticket does allow you to hop off in Nazca and get on the next bus if you so wish. Huacachina is a small town, where the bus can only drive on one street. Wild Rover Hostel is our drop-off point and is less than a 5 min walk from all other popular hostels and hotels. Leave the sunny desert town of Huacachina, home to the only desert oasis in South America and travel to the huge busy city by the sea, Lima. Only a few hours away but like entering a whole new world. Take a tour of a boutique Pisco vineyard to discover how Pisco, the national drink of Peru, is made. Best of all, get lots of free samples of pure pisco, sweet wine, and Pisco baileys! Larcomar: Built into the side of the cliff and mostly underground, this mall makes for quite the sight. It has incredible views of the Pacific Ocean and is perfect to spend an afternoon shopping. Departures From: Wild Rover Hostel (within close walking distance of most hotels/hostels in Huacachina). We recommend staying at least 2 night in Lima. This way you will have the chance to see the center and cycle around the area of Miraflores or do one of the many other activities this city offers. Any hotel/hostel in Miraflores or Barranco. Selected points in downtown (old town) Lima. Buses operate EVERYDAY in EVERY direction. Follow our recommended plan or hop on and hop off as much as you like. DEPARTURE POINT IN CUSCO: Peru Hop Private Terminal. MAIN ACTIVITY IN HUACACHINA: Dune Buggy and Sandboarding – Tours at 16:30pm. Tours last 2 hours. LIMA HOTEL/HOSTEL DROP-OFFS: Miraflores and Barranco districts.